We are manufacturers and wholesalers dealing in Rhinestone Jewelry i.e. Jewellery set, necklace, ear ring, bangles etc. We are manufacturers and wholesalers dealing in ladies jewellery i.e. Jewellery set, necklace, ear ring, bangles etc. Pink rhinestone bangles made from high quality AAA stones with a high quality brass base. These bangles go perfectly as high fashion items. Contact us for more details and designs now. 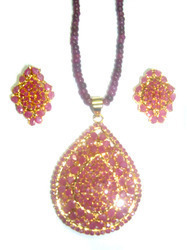 We are engaged in offering good quality of rhinestone jewelry. We are manufacturing wide range of rhinestone jewelry.